* Do Mitigation Strategies Reduce Global Warming Potential in the Northern U.S. Corn Belt? in the Northern U.S. Corn Belt? A study by a team of USDA-ARS researchers in Minnesota and North Dakota examined three crop production systems for their effect on productivity, greenhouse gas emissions, and change in soil carbon (C) over time. The goal was to assess whether global warming potential and global warming potential per unit biomass produced were reduced through combined mitigation strategies when implemented in the northern U.S. Corn Belt. 1. Business as usual (BAU). We defined a corn–soybean rotation using conventional tillage and applying inorganic N–P–K fertilizer as the BAU system. 2. Maximum C sequestration (MAXC). A corn–soybean–wheat/alfalfa–alfalfa rotation with strip tillage and inorganic N–P–K fertilizer application system was designated as the MAXC system. 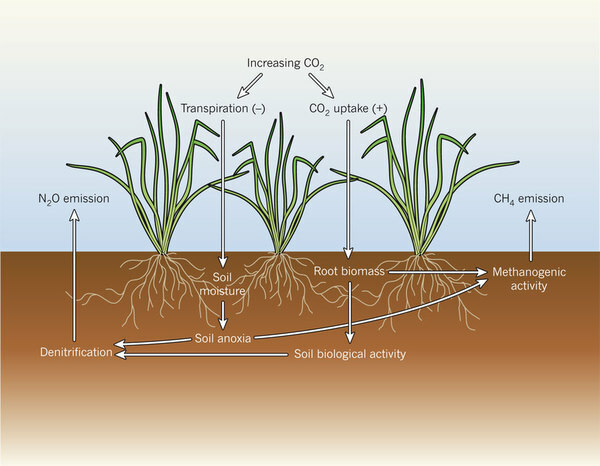 This system was included as an alternative system that may mitigate global warming potential through soil C sequestration without a loss of plant productivity. 3. Optimum greenhouse gas benefit (OGGB). A corn–soybean–wheat/alfalfa–alfalfa rotation with strip tillage but without inorganic N–P–K fertilizer application was designated as the OGGB system. The OGGB system may mitigate global warming potential through soil C sequestration and reduced N2O emission but at a loss of crop yield. Biomass production, greenhouse gas flux, change in total and organic soil C, and global warming potential were compared among the three systems. Soil organic C accumulated only in the surface 0 to 5 cm. Three-year average emission of N2O and CH4 was similar among all management systems. When integrated from planting to planting, N2O emission was similar for MAXC and OGGB systems, although only MAXC was fertilized. Overall, the three systems had similar global warming potential based on 4-year changes in soil organic C, but average rotation biomass was less in the OGGB systems. Global warming potential per dry crop yield was the least for the MAXC system and the most for OGGB system. This suggests management practices designed to reduce global warming potential can be achieved without a loss of productivity. For example, MAXC systems over time may provide sufficient soil C sequestration to offset associated greenhouse gas emission. A recent review article in Agronomy Journal focused on the impact of temperature, CO2, and ozone on agronomic crops -- and the implications for crop production. Understanding these implications for agricultural crops is critical for developing cropping systems resilient to stresses induced by climate change. There is variation among crops in their response to CO2, temperature, and precipitation changes. With the regional differences in predicted climate, a situation is created in which the responses will be further complicated. For example, the temperature effects on soybean could potentially cause yield reductions of 2.4% in the South but an increase of 1.7% in the Midwest. The frequency of years when temperatures exceed thresholds for damage during critical growth stages is likely to increase for some crops and regions. The increase in CO2 contributes significantly to enhanced plant growth and improved water use efficiency; however, there may be a downscaling of these positive impacts due to higher temperatures plants will experience during their growth cycle. A challenge is to understand the interactions of the changing climatic parameters because of the interactions among temperature, CO2, and precipitation on plant growth and development and also on the biotic stresses of weeds, insects, and diseases. Agronomists will have to consider the variations in temperature and precipitation as part of the production system if they are to ensure the food security required by an ever increasing population. A recent review article in Agronomy Journal focused on the impact of temperature, CO2, and ozone on forage and rangeland. There have been relatively few studies of climate change effects on pasture and rangeland (grazingland) species compared to those on crop species, despite the economic and ecological importance of the former. A recent review article in Agronomy Journal focused on responses of pastureland and rangeland species to rising atmospheric CO2 and climate change (temperature and precipitation), and discussed plant and management factors likely to influence pastureland and rangeland responses to change (e.g., community composition, plant competition, perennial growth habit, seasonal productivity, and management methods). Overall, the response of pastureland and rangeland species to increased CO2 is consistent with the general responses of C3 and C4 vegetation, although exceptions exist. Both pastureland and rangeland species may experience accelerated metabolism and advanced development with rising temperatures, often resulting in a longer growing season. However, soil resources will often constrain temperature effects. In general, it is expected that increases in CO2 and precipitation will enhance rangeland net primary production (NPP) whereas increased air temperatures will either increase or decrease NPP. Much of the uncertainty in predicting how pastureland and rangeland species will respond to climate change is due to uncertainty in future projections of precipitation, both globally and regionally. This review reveals the need for comprehensive studies of climate change impacts on pastureland and rangeland ecosystems that include an assessment of the mediating effects of grazing regimes and mutualistic relationships (e.g., plant roots-nematodes; N-fixing organisms) as well as changes in water, carbon, and nutrient cycling. A recent article by scientists at Agriculture and Agri-Food Canada reported on the results of a study to determine the effects of two tillage treatments (moldboard plow and no-tillage) and three mineral N application rates (0, 80 and 160 kg N per hectare) on annual and biennial N2O fluxes. The site was an artificially drained and therefore well structured humic gleysol near Montreal Quebec, on a corn–soybean rotation. Emissions in 2004 and 2005 (April–November) ranged from 1.0 to 2.5 kg N2O–N per hectare. Throughout both years tillage had no effect on N2O emissions. During 2004, under corn cultivation, N2O emissions increased with the N fertilization rate. Between 0.9 and 1.3% of applied fertilizer N was lost as N2O–N, similar to the IPCC estimate of 1%. There was no significant interaction between tillage and N fertilization rate on N2O emissions during either year. During the second year, under soybean cultivation, no N fertilizer was applied. As N2O emissions from the different fertilizer treatments were similar, we concluded that there was no carry-over effect of the fertilization applied to maize in the previous year. Yield-based N2O emissions were similar between the different tillage types and fertilization rates. (ii) Soil tillage and the tillage–fertilization interaction had no measurable effect, consistent with previous reports that tillage of well-aerated agricultural soils has little effect on N2O emissions. A long-term rainfed study conducted in eastern Nebraska provided the opportunity to determine both the effects of different tillage treatments and cropping systems on soil N and soil organic C (SOC) levels throughout the soil profile. The study included six primary tillage systems (chisel, disk, plow, no-till, ridge-till, and subtill) with three cropping systems (continuous corn, continuous soybean, and soybean-corn). Soil samples were collected to a depth of 150-cm in depth increments of 0–15, 15–30, 30–60, 60–90, 90–120, and 120–150 cm, composited by depth in the fall of 1999 after harvest, and analyzed for total N and SOC. Significant differences in total N and SOC levels were obtained between tillage treatments and cropping systems at depths of 0–15, 15–30, and 30–60 cm depths. Total N and SOC accumulations throughout the profile (both calculated by depth and for equivalent masses of soil) were significantly affected by both tillage treatment and cropping system, with those in no-till the greatest among tillage treatments and those in continuous corn the greatest among cropping systems. Soil N and SOC levels were increased at deeper depths in the profile, especially in those tillage systems with the least amount of soil disturbance. Most significant was the fact that soil N and SOC was sequestered deeper in the profile, which would strongly suggest that N and C at these depths would be less likely to be lost if the soil was tilled. Recent research by a team of U.S. Department of Agriculture (USDA) and university scientists has shown that in a warmer, CO2-enriched world, both soil water content and productivity in semi-arid grasslands may be higher than previously expected, according to an article in the August 11, 2011 edition of the journal Nature. The research, which is in the fourth year of an eight-year study, is being conducted at the USDA-ARS High Plains Grasslands Research Station near Cheyenne, Wyo. A warming climate has been predicted to generally lead to drier soils through increased evaporative demand. However, higher CO2 levels cause leaf stomates to partly close, lessening the amount of water vapor that escapes and the amount of water plants draw from soil, countering the effect of the warmer temperatures, at least among some plants. The researchers found that elevated CO2 can completely reverse the desiccating effects of moderate warming in warm-season C4 grasses. It is unlikely, however, to offset more severe drought due to combined warming and reduced precipitation projected for many regions of the world. Simulations of levels of warming and CO2 predicted for later this century demonstrated no net change in soil water, and actually increased levels of plant growth for warm-season grasses. Only the warm-season grasses had their growth boosted higher by CO2 and warmer temperatures, however, not cool-season grasses. Farmers and policymakers should wait before converting Conservation Reserve Program land to corn and soybean production, according to a Michigan State University (MSU) study. The study, which appears in the current issue of the Proceedings of the National Academy of Sciences, focuses on Conservation Reserve Program (CRP) land, a federal program encouraging farmers to grow natural vegetative cover rather than crops, and its role in the production of biofuels. A team of MSU researchers shows directly for the first time that the carbon costs of converting these lands to corn and soybeans is high – even when care is taken to protect soil carbon from loss by using no-till cultivation practices. Carbon debt results from carbon dioxide and other greenhouse gases released when land is converted from natural vegetation to agriculture. It's called debt because until a new biofuel crop creates enough renewable fuel to offset the lost CO2, the new biofuel crop has no climate benefit. In fact, it's the same as burning fossil fuel as far as the atmosphere is concerned, said Ilya Gelfand, MSU postdoctoral researcher who worked with the Great Lakes Bioenergy Research Center. "Conversion creates carbon debt, which must be paid off before the biofuel crop can provide climate mitigation benefits," he said. "No-till practices (planting without plowing) reduced by two-thirds the amount of debt created by the conversion, but still it would take 29 to 40 years for it to be repaid by growing corn and soybean for biofuel." Alternatively, growing CRP grasses harvested for cellulosic ethanol would create no debt and provide immediate energy and climate mitigation benefits, he added. "The conversion of CRP lands to corn and soybean production has a larger climate consequence than has been previously estimated," Gelfand said. "And much of the debt comes from the loss of soil carbon that would have been stored in CRP land in the future had it not been converted." Nationally, more than 30 million acres are set aside as CRP land, and they provide significant climate, wildlife and other conservation benefits, said Phil Robertson, a co-author and MSU professor of crop and soil sciences. "Growing CRP grasses rather than using the land for corn or corn-soybean production could maintain these benefits indefinitely while providing a valuable bioenergy feedstock," he said. "It could be a win-win for farmers and the environment once a market for cellulosic biofuel develops." The GLBRC team also included MSU researchers Poonam Jasrotia and Stephen Hamilton as well as scientists from the University of Toledo. The study was performed at Michigan State’s Kellogg Biological Station in partnership with MSU’s Long-term Ecological Research program funded by the National Science Foundation. Kees Jan van Groenigen, Research Fellow at the Botany department at the School of Natural Sciences, Trinity College, Dublin, and colleagues present evidence in Nature 475:177-178 (July 14, 2011) that rising levels of CO2 could cause increased emissions of other, much more potent, greenhouse gases such as methane (CH4) and nitrous oxide (N2O) from soils. Methane is produced by anaerobic methanogenic microorganisms that thrive in wetlands, including rice paddies, where labile (biologically accessible) carbon is available and diffusion of oxygen into the soil is severely restricted. Nitrous oxide is mainly produced in soils by aerobic nitrifying and anaerobic denitrifying bacteria. The interaction between nitrogen availability and soil water content controls the rate of N2O production. The respective global-warming potentials of CH4 and N2O are 25 and 298 times greater than that of CO2, and thus they influence Earth's energy balance even though they occur in much smaller concentrations. Van Groenigen and colleagues collected information from 49 published studies that reported the effect of atmospheric CO2 enrichment on CH4 and N2O fluxes from soils. Using a meta-analysis, they show that elevated CO2 stimulated N2O emissions by 18.8%, and that CH4 emissions from wetlands increased by 13.2% and from rice paddies by as much as 43.4%. Notably, they also suggest the mechanisms that are probably responsible for these observed increases in greenhouse-gas emissions. From their meta-analysis, van Groenigen et al. estimate that rising levels of atmospheric CO2 will result in more output of N2O from upland soil (at a rate equivalent to 0.57 Pg CO2 yr−1) and of CH4 from rice paddies and wetlands (equivalent to 0.56 Pg CO2 yr−1). They suggest that these increases are caused by reduced plant transpiration under conditions of elevated CO2, resulting in increased soil moisture. Together with increased root biomass, this leads both to greater denitrification (and hence increased N2O emission) and to more methanogenic activity (and hence increased CH4 emission). The increase in these greenhouse gases will thus partially offset the predicted enhanced uptake of carbon by terrestrial ecosystems in a high-CO2 world. A research team headed by Sarah C. Davis, Energy Biosciences Institute, University of Illinois at Urbana-Champaign, published an article in a 2011 issue of Frontiers in Ecology and the Environment that analyzed greenhouse gas emissions from different ethanol feedstocks. In the U.S., 95% of biofuel is produced from corn, an intensively managed annual crop that is also grown for food and animal feed. Using the DAYCENT model, the research team estimated the effects on ecosystem services of replacing corn ethanol feedstocks with the perennial cellulosic feedstocks switchgrass and miscanthus. If cellulosic feedstocks were planted on cropland that is currently used for ethanol production in the US, more ethanol and grain for food could be produced while at the same time reducing nitrogen leaching (−15 to −22%) and greenhouse-gas (GHG) emissions (−29 to −473%). The GHG reduction was large even after accounting for emissions associated with indirect land-use change. Conversion from a high-input annual crop to a low-input perennial crop for biofuel production can thus transition the central U.S. from a net source to a net sink for GHGs. A research team headed by Andrew C. Kemp, Yale University, has published an article in a 2011 issue of Proceedings of the National Academy of Sciences that presents new sea-level reconstructions for the past 2,100 years based on salt-marsh sedimentary sequences from the U.S. Atlantic coast. The data from North Carolina reveal four phases of persistent sea-level change after correction for glacial isostatic adjustment. Sea level was stable from at least BC 100 until AD 950. Sea level then increased for 400 years at a rate of 0.6 mm/year, followed by a further period of stable, or slightly falling, sea level that persisted until the late 19th century. Since then, sea level has risen at an average rate of 2.1 mm/year, representing the steepest century-scale increase of the past two millennia. This rate was initiated between AD 1865 and 1892. Using an extended semiempirical modeling approach, we show that these sea-level changes are consistent with global temperature for at least the past millennium. California will in 2013 likely launch an emissions trading scheme with a CO2 price far higher than the EU or NZ markets, a move that could trigger a gold rush for cheap offset projects. Under rules approved in October 2011, companies covered by the state’s scheme will be able to use carbon credits from emission reduction projects, instead of state-issued permits to cover up to 8 percent of their emissions. Analysts say California’s aim of returning state-wide emissions to 1990 levels by the end of the decade could potentially create demand for about 221 million offsets over the next 8 years. And with Californian CO2 permit prices already fetching around $19 -- 30 percent more than prices in the EU -- the rules could spark a scramble to develop emission reduction projects that can produce credits that the state’s emitters can use. So far, eligible credits can come from four project types endorsed by regulators -- those that cut emissions of ozone-depleting substances, methane from agriculture and others that store carbon in trees. They currently fetch around $12 and are already in demand due to the $7 discount they fetch below permit prices, but the number of approved projects is set to expand. “We do expect a significant bump in offset projects with many of the nearly 500 projects already in our system now getting the green light to go ahead to verification and lots of new projects coming in,” said Gary Gero, president of the Climate Action Reserve, which approves project types on behalf of the state. “I think the former will become quite apparent in the short term while new projects take time to identify and enter into contracts so we’re not likely to see that bump start to form until later in the first quarter 2012,” he said. A minimum floor price of $10/t at the first 2013 auction of permits will also provide some certainty for emission reduction project developers, who are having a tough time globally. While the price of carbon offset credits that EU companies can use to meet targets hit a record low of just $9.40 last week, investment bank Barclays Capital predicts there will not be enough California-eligible credits to meet demand. To bridge the demand-supply gap and keep compliance costs down, regulators have suggested they will allow companies to use other types of credits, a prospect that is enticing developers. California officials have suggested they will allow three additional project types to count for compliance, but even if that happens, the market may still need more credits. The state wants buyers of credits to replace them if they later turn out to be faulty – a move that could cost them millions of dollars and drive buyers to the relative safe haven of the permit market. She added power companies may have an appetite to develop their own offset projects, a move that has seen big utilities in Europe snap up staff from developers as they seek to cut out the middle man. But with the price of U.N.-backed offsets on its knees and supply set to outstrip demand, investors in offsets could be looking across the Atlantic. The National Science Foundation (NSF) has partnered with NBC Learn, the education arm of NBC News, to create four award-winning multi-media series for educators and students. These original resources--short videos, documents, images and activities—are videos, documents, images and activities--are available FREE on the NSF, NBC Learn and Science360 websites. One of the four series is called “Changing Planet, which explores the impact that climate change is having on our planet. Each of the 15 videos, 3-5 minutes long, follows scientists in the field who are studying the dramatic impacts of rising temperatures in the air, in the water and on land. Designed specifically for classroom use, each report has a lesson plan and activities created by the "Windows to the Universe" team at the National Earth Science Teachers Association. NSF has also launched Science360 Radio. This is the first free Internet radio stream dedicated to programming about Science, Technology, Engineering and Math (STEM). It’s 24/7 programming with more than 100 radio shows and podcasts. Two reports from the Technical Working Group on Agricultural Greenhouse Gases (T-AGG) were released in November 2011 that explore the spectrum of greenhouse gas (GHG) mitigation opportunities in agriculture in the U.S. The principal authors are Lydia P. Olander, with the Nicholas Institute at Duke University, and co-invesigator Alison J. Eagle. T-AGG was formed to provide basic information on GHG mitigation opportunities in agriculture. The T-AGG assessment covers a wide range of agricultural practices for principal cropping sys­tems in the United States. It provides a roadmap and resource for programs and initiatives that are designing protocols, metrics, or incentives to engage farmers and ranchers in large-scale efforts to enhance GHG mitigation on working agricultural land in the United States. The T-AGG assessment identified 28 agricultural land management activities likely to be beneficial for GHG mitigation. Five have relatively high mitigation potential due to land use changes and are applicable in only some regions. Fifteen tend to have lower mitigation potential, do not shift land use, and are applicable in many U.S. regions. The remaining eight have significant data gaps and need additional research. These activities include increased cropping intensity, agroforestry, histosol management, and rotational grazing for soil C sequestration or conservation, as well as irrigation improvements and improved manure application for N2O emission reduction. Rotational grazing on pasture lands is particularly interesting. While the C sequestration potential from this practice seems positive, its broader impact on the efficiency of livestock production and the potential for broader mitigation effects is even more promising. For 14 other activities, mitigation potential was uncertain, low, or negative. Six of these activities may deserve additional attention as they have been little studied or studies have yielded variable results. Seven of these activities have low or negative net GHG mitigation potential. The final activity, biochar application, may have significant potential, but research on the magnitude of this potential and on life-cycle implications is needed. A new study has matched future climate change hotspots with regions already suffering chronic food problems to identify highly-vulnerable populations, chiefly in Africa and South Asia, but potentially in China and Latin America as well, where in fewer than 40 years, the prospect of shorter, hotter or drier growing seasons could imperil hundreds of millions of already-impoverished people. The report, "Mapping Hotspots of Climate Change and Food Insecurity in the Global Tropics," was produced by the CGIAR Research Program on Climate Change, Agriculture and Food Security (CCAFS). The work was undertaken by a team of scientists responding to an urgent need to focus climate change adaptation efforts on people and places where the potential for harsher growing conditions poses the gravest threat to food production and food security. "This is a very troubling combination," she added. For example, in large parts of South Asia, including almost all of India, and parts of sub-Saharan Africa -- chiefly West Africa -- there are 369 million food-insecure people living in agriculture-intensive areas that are highly exposed to a potential five percent decrease in the length of the growing period. Such a change over the next 40 years could significantly affect food yields and food access for people -- many of them farmers themselves -- already living on the edge. Developing countries are required to produce robust estimates of forest carbon stocks for successful implementation of climate change mitigation policies related to reducing emissions from deforestation and degradation (REDD). A NASA-led research team has recently presented a “benchmark” map of biomass carbon stocks over 2.5 billion hectares of forests on three continents, encompassing all tropical forests, for the early 2000s. This will be invaluable for REDD assessments at both project and national scales. They mapped the total carbon stock in live biomass (above- and belowground), using a combination of data from 4,079 in situ inventory plots and remote imagery of forest structure to estimate carbon storage. The total biomass carbon stock of forests in the study region is estimated to be 247 Gt C, with 193 Gt C stored aboveground and 54 Gt C stored belowground in roots. Forests in Latin America, sub-Saharan Africa, and Southeast Asia accounted for 49%, 25%, and 26%of the total stock, respectively. By analyzing the errors propagated through the estimation process, uncertainty at the pixel level (100 ha) ranged from ±6% to ±53%, but was constrained at the typical project (10,000 ha) and national (>1,000,000 ha) scales at ca. ±5% and ca. ±1%, respectively. The benchmark map below illustrates regional patterns and provides methodologically comparable estimates of carbon stocks for 75 developing countries where previous assessments were either poor or incomplete. A recent study by B.T. Anderson, Department of Geography and Environment at Boston University, published in the journal Climatic Change asserts that substantial fractions of the globe could experience seasonal-mean temperature extremes with high regularity, even if the global-mean temperature increase remains below the 2°C target. Results of the study indicate that given a 2°C global mean temperature increase, it is expected that for 70–80% of the land surface maximum seasonal-mean temperatures will exceed historical extremes in at least half of all years. That is, the current historical extreme values will effectively become the norm. Many regions of the globe -- including much of Africa, the southeastern and central portions of Asia, Indonesia, and the Amazon -- will reach this point given the “committed” future global-mean temperature increase of 0.6°C (1.4°C relative to the pre-industrial era) and 50% of the land surface will reach it given a future global-mean temperature increase of between 0.8 and 0.95°C (1.6–1.75°C relative to the pre-industrial era).